One never knows where my art might appear. I have painted on many interesting items over the years. I have painted on old weathered barn boards; sides of old wooden crates, old nail kegs, wheel covers; saw blades, cross-cut saws, fungus, feathers, banjo heads; guitar cases and many more things. Another “kind of canvas” is the shoulder blades of deer. Here is an example of a painting on such a shoulder-blade. 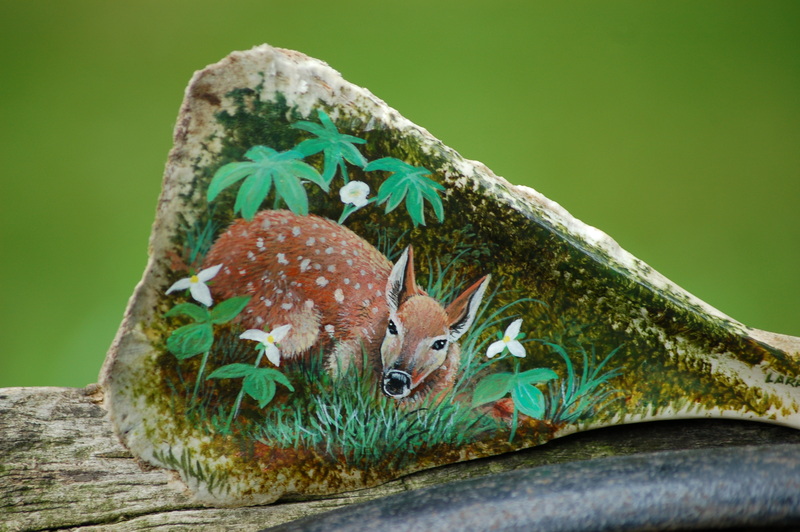 The fawn was painted with acrylic paints on the seasoned shoulder-blade of a deer. My friend, Randy Tost found the slightly, rodent-gnawed shoulder-blade on his property and wished something painted on it. I told him that, indeed, painting would be possible.